Pothashang News Service: Imphal, December 30, 2017: The Meitei community today celebrated Emoinu festival worshipping the mother goddess of wealth, peace and prosperity, Emoinu Ahongbi. Emoinu Eratpa ritual is performed at home and in public places on the 12th of the Wakching month in the Manipuri lunar calendar. According to a Meitei myth, Goddess Emoinu lands on earth every year on this day and visits each home to shower her blessings. People lit candles and decorate with lights at home to welcome the Goddess. A well-prepared meal with the main dish of silver fish curry is offered to the deity, who takes rest at funga lairu (traditional fireplace in the kitchen). Lord Sanamahi is also offered with fresh vegetables, fruits and uncooked rice to seek blessing for prosperity. Apart from worshipping Emoinu at home, rituals of Emoinu worship were also organised at the community level. Major celebrations were held at Wangkhei Ningthem Pukhri Mapal in Imphal East district and Yumnam Leikai Lairembi Lampak in Imphal West. The festival was organised with great fanfare.It is said the worship of Emoinu began in the 5th century when only the royal family worshipped the goddess. Later in the 15th century, the common people also began to worship Her. The Goddess is worshipped both by the Hindu Meitei and the Sanamahi Meitei in the state. 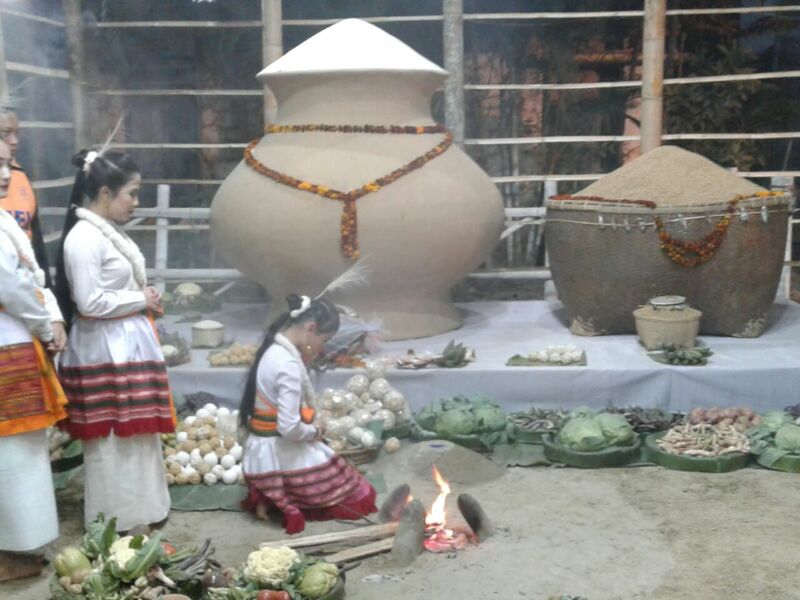 The celebration began with the invocation of Pena Yaikairol and offering of seasonal vegetables, fruits, traditional sweets and clothes to the goddess. In the afternoon, a fire place is lit up to welcome the Goddess. Music and dance performances were also presented in the evening. The festival is also celebrated at different locations organised by local clubs and civil society organisations. People wishes for a peaceful state where there is no bloodshed and social unrest.